With just two weeks before the health care exchanges open and the Affordable Care Act really kicks in, the only thing that's clear about the law is that Americans are totally confused about what it does. Two polls released this week paint a dismal picture for those of us who consider it our job to explain what health care reform means to the public. The first, from the Wall Street Journal and NBC News, showed that almost 70% of people don't understand what Obamacare is or that they understand only a part of it. While 31% thought it was a good idea, 44% thought it was a bad one. The remaining 25% weren't sure. It gets worse. When the poll specifically looked at the uninsured -- which Obamacare is specifically designed to help -- more than three-quarters of them said they didn't understand how the law would affect them. Another poll, from the Pew Research Center and USA Today, found that 53% of Americans disapprove of Obamacare, compared with 42% who approve. In this poll, though, only a third said they had little or no understanding of how the law would affect them. Almost half of people thought that health exchanges would not be available in their state. Most Americans already get health insurance from their jobs, Medicaid, Medicare or the Department of Veterans Affairs. The vast majority of those people will continue to do so. But starting in 2014, people without health insurance will get insured in one of two ways. If they are very poor -- making less than 133% of the poverty line -- then they will get Medicaid through the expansion of the program. That is, if their state has opted to participate in the program. If their state has not, then they may continue to be uninsured. The rest of the people without health insurance will go to the exchanges to get it. There, they can choose from plans with different levels of co-payments and deductibles, according to how much they want to spend. If they make less than 400% of the poverty line, they will get a tax credit or subsidy to help with the cost. No one can be denied health insurance anymore, and no one can be charged more for being sick. All the plans are from private insurance, and they're going to compete for your business. There are other bells and whistles, but that's Obamacare in a nutshell. If you ask me, I think Obamacare will do more good than harm. Many uninsured Americans are unable to get insurance in the market as it exists today, especially if they have chronic conditions. Those who can afford to often pay a fortune for it. Obamacare is a solution to these problems. While a relatively small number of people will see their rates go up, they're mostly young, healthy people making more than 400% of the poverty line. The vast majority -- more than 90% of people getting their insurance in the exchanges -- will get subsidies to make their insurance more affordable. Plus, now everyone, even if they're young and healthy at the moment, will be protected if they or a member of their family gets sick or when they grow old. There are places you can go right now to get more information. For instance, you can visit www.healthcare.gov. At that website, by answering a few questions, you can see what options will be available to you starting October 1. After that date, you will be taken to your state's exchange, where you will be able to get actual information about plans and sign up for them. Coverage will start January 1. Originally, Obamacare was expected to come with more than half a billion dollars to be spent on outreach and education efforts about the exchanges. This money was supposed to be used to help people understand how Obamacare was supposed to work for everyone. But the Republican-led House of Representatives cut the whole implementation budget (emphasis added). When Health and Human Services Secretary Kathleen Sebelius was further forced to move what little money remained in the PR budget into the Prevention Public Health Fund (which was also cut), Sen. Max Baucus, one of the main architects of Obamacare, got upset. He remarked that the law was complicated and that we would get a "train wreck." Many leapt on this comment and proclaimed that even Baucus thought the law was a mess. But that's not what he said. He meant that if people didn't understand how it worked, then it would be a mess. At the moment, his prediction could still come true. 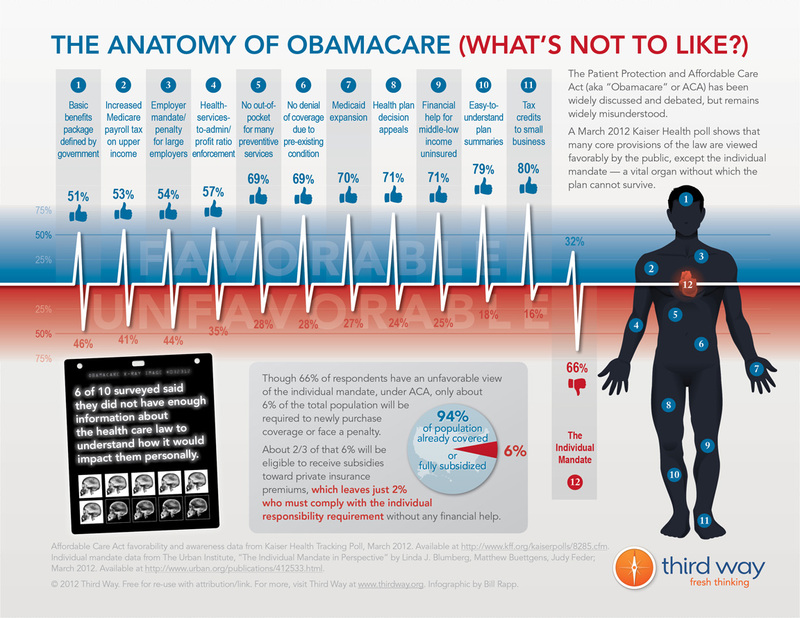 The latest polls show that, as he feared, too few people understand how Obamacare functions. But there's still time. It will take a lot of outreach and a lot of elbow grease, but supporters of the law believe they are up to the task. Time will tell. October 1 is approaching fast.